From October 21 to 24 Cubacel announces Double Balance Recharge, now you can please one more time your family and friends in Cuba. Recargasacuba.com offers the best prices plus excellent additional gifts reloading. The cell in Cuba receives twice the amount recharged immediately. For instance, a € 20 recharge the cell receives: 48.74 CUC. For a 40 € recharge the cell receives 97.48 CUC. Free calls to Cuba, 5% balance. For every recharge made Recargasacuba.com provides 5% of the amount paid in balance to make free calls to Cuba from their website LlamadasaCuba.com and where they have great prices. 50 SMS to send to Cuba. Receive 50 credits in your account RecargasaCuba.com per charge on that you can use to send SMS messages to Cuba. 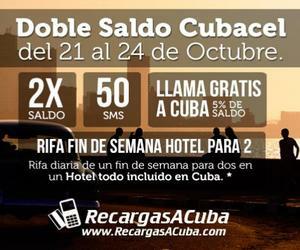 During the 4 days of the offer, Recargasacuba.com will have a daily raffle for weekend stay (3 days and 2 nights) for two at an All Inclusive hotel in Cuba (worth € 350) among customers who recharge on that day . To participate you must only do a recharge, each recharge increases the chances of winning the raffle. The period of this promotion is from the October 21, 2014 at 00.01 (in Cuba) until October 24 at 23:59 am (in Cuba). The promotion applies to recharges received from Cubacel client 20CUC to 50 CUC. Both the nominal recharge bonus as no consumption limits. The bonus can be used on all services available to prepay customers the same Cubacel existing tariffs for prepaid customers. The life cycle of the balance depends only on the recharged value, without taking into account the additional bonus. The life cycle varies between 180 days (for refills 29.99 CUC to 20 CUC) and 330 days (for highest recharge to 40 CUC). In all cases, the customer has 30 additional days to recharge before the line ends. During the 4 days of the offer, Recargasacuba.com will have a daily raffle for weekend stay (3 days and 2 nights) for two at an All Inclusive hotel in Cuba (worth € 350) among customers who recharge on that day. To participate you only need to do a reload. It is important to remember that each refill increases the chances of winning the raffle. The hotel and date of stay will be chosen by the winner. You should choose the hotel from the list of hotels that provide and the date of stay between October 10 and November 28 of this year. Date and final hotel of stay are subject to availability. The raffle winner will choose the two people in Cuba would enjoy the stay. This drawing is meant to be enjoyed by family and / or friends of the winners in Cuba. Winner must provide all information that is required for the proper coordination of stay, in a period no longer than one week to be declared winner. In case of availability of transportation back and forth (by the turoperadoras agencies that are collaborating our Cuba) between a place of origin (designated by the raffle winner) and hotel stay, such transport is included within the offer. In any case, including one in which transport to and from the hotel stay is offered, the total value of the supply will exceed the limit of 350 €.